Thoothpick holder, a toothpick please! Always aware of the ecologic matters and natural forms, Branzi is one of the designers most aware of the potential in the use of wood, a materail, that acoording to him, is one of the best available materials to produce "objects with which we can set up relations, not only of use and functionality, but also of psychological, symbolic and poetic nature." A small man leans forward and grabs a toothpick. 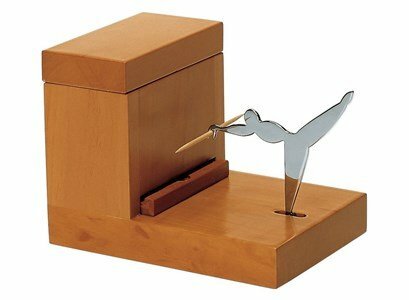 Totally made of pear tree wood, this toothpick holder is also an excelent piece of decoration. The small man is made of stainless steel. A container holds the toothpicks, so that the little man can, when asked, hand out a toothpick. Just push the leg and he will delicatly withdraw a toothpick from the drawer. As many times as necessary.